I’m so excited about hosting Cindy Anstey on the blog today, where she is sharing a deleted scene! Cindy is the author of Love, Lies, and Spies; Duels and Deception; Suitor snd Sabotage; and her latest novel, Carols and Chaos. 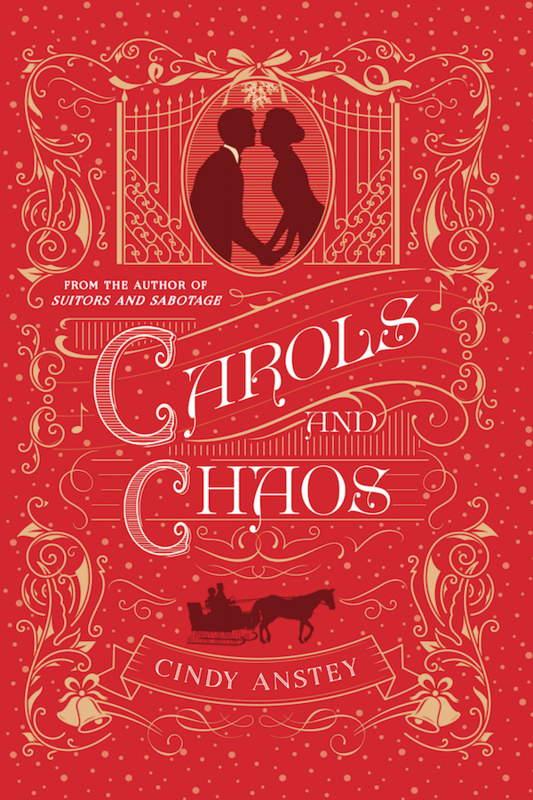 I can’t wait to read Carols and Chaos as the premise totally reminds me of the Downton Abbey Christmas episodes! A deleted scene from Chapter One of Carols and Chaos by Cindy Anstey that was deleted when the story headed in a different direction. Leaping up, arms outstretched, Kate flew toward Matt, just as the bull’s head made contact with her foot. It was a glancing blow but it spun her around. Twisting midair, Kate tried to correct her path, to no avail; she would fall short of the fence. There was little doubt that a trampling would soon ensue. Leaning toward her, legs locked around the top rails of the fence, Matt reached for Kate as she fell. He caught her arm before she hit the ground and tugged her up and over the fence in a Herculean move. Scraping across the top, she landed on the other side in a most undignified sprawl, and slid across a patch of ice until she came to a stop against a collection of thatch. Winded, she lay there for a moment before lifting her head. Matt, however, was not as well placed, hanging upside down, his legs still hooked around the wooden railing; his arms flailed, as he tried to rebalance and pull himself upright. The bull watched menacingly from mere feet away—perhaps as little as three. Jumping to her feet, Kate winced slightly as she put weight on her left foot and limped over to the fence and Matt. She grabbed him by the shoulders, stepping back, pulling him with her. “Let go,” she said as she braced, and then nearly dropped him when he did. They landed together in a tangled heap and quickly scrambled to stand. Looking down at her foot, Kate was suddenly aware that it was throbbing. “Nothing serious. Just bruised,” she said aloud to no one in particular. “It’ll be alright in no time.” It would have to be; Yuletide was not the season to be laid up. There was far too much to do. “Would you like me to check it, Miss Darby?” Johnny asked with a saucy invitation, his voice drifting to her from somewhere behind Matt. Kate glanced up at Matt; she answered his grin with one of her own. “Thank you for the offer, Johnny, but… ah, no. That won’t be necessary,” she replied as she turned and hobbled toward the cart. Kate shook her head. She best get back to the manor before Mrs. Lundy started to worry. Glancing over her shoulder, she saw that Matt hadn’t moved but stood watching her. Then, in a deft move, he stepped forward, picked her up and carried her to the cart. 1817. The happy chaos of the Yuletide season has descended upon the country estate of Shackleford Park in full force, but lady’s maid Kate Darby barely has the time to notice. Between her household duties, caring for her ailing mother, and saving up money to someday own her own dress shop, her hands are quite full. Matt Harlow is also rather busy. He’s performing double-duty, acting as valet for both of the Steeple brothers, two of the estate’s holiday guests. Whenever she is not sitting at the computer, throwing a ball in the backyard, gardening or reading, Cindy can be found–actually, not found–adventuring around the world with her hubby. She has lived on three continents, had a monkey in her yard and a scorpion under her sink, dwelt among castles and canals, enjoyed the jazz of Beale St and attempted to speak French. Cindy loves history, mystery and… a chocolate Labrador called Chester. Estates and Yuletide sound like just the thing, and I’ve been loving the book’s charming cover! I love how charming the cover is too! This book has been on my TBR since I first read about it. Love the cover and premise. Same! It’s definitely perfect for the holiday season! Thank you! I loved hosting Cindy’s deleted scene! It’s definitely the perfect read for the holiday season! I’m so excited to read it. Sounds great. I agree! I love the Downton Abbey vibes!